A makeup bouquet? Yas, please! For the yearly mush that is Valentine’s Day, not all women want to receive a bouquet of flowers that will eventually wilt after a few days. There are other arrangements that can make a more lasting impression than cliché red roses. If you’re part of this movement, show this list to your significant other before V-Day and pray that they take the hint. There’s no better way to show your love than supporting her obsession with contouring, highlighting, and blending. Say it with a bouquet of new makeup. If you need help in choosing products, just ask the friendly salesladies of all-in-one beauty shops like Beauty Bar, Beauty Buffet, and Watsons, or better yet, ask her bestie for tips. How to make: Click here for tutorials. Homer Simpson would tear up at the sight of this glazed, sprinkled, and frosted work of art. A “doughquet” involves a quick stopover at her favorite donut shop and DIY arrangement. Try not to devour your own creation. Pacify her sweet tooth with a creative arrangement of her favorite chocolates and candies. It’s a level above the standard box of chocolates. Buy a pack of your favorite bacon brand, roll it into roses, fry or bake, and then arrange into a beautiful greasy bouquet. If she’s vegetarian, there’s facon, the veggie bacon. Make a few for yourself while you’re at it. There are so many options to choose from—nuggets, chicken fingers, poppers, wing kebabs, or just good ol’ fried chicken. You may buy a bucket or box from her favorite fast food joint, or use your kitchen skills to whip up your own. 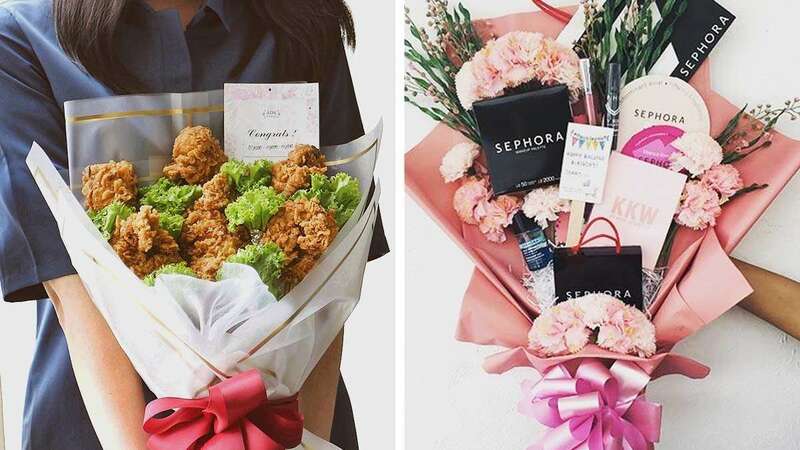 Then arrange into a finger lickin’ good bouquet. For the ultimate Tita, this one is made of pastillas de leche that’s carefully rolled and molded into pretty roses. It will go well with her lace alampay and floral shawl. Instead of giving her the usual box of cupcakes, call your trusted baker and get a customized cupcake bouquet. They’re cupcakes with floral buttercream toppings and arranged to look like a basket or bouquet of flowers. On the same level of mushiness as a rose bouquet, this one is an arrangement of cute stuffed toys that will make her go, “Aww!” You may even mix it up with chocolates and other add-ons. This may not be the most environmental option, but if she’s the type who squeals at the sight of cute balloon arrangements, then give her one of her own. She’ll display it at home or on her office table until the balloons shrink into oblivion. If she’s on a strict diet and the sight of chocolates will make her wince, order a basket or bouquet of fruits instead. There’s even a version where the fruits are carved and arranged to look like flowers.